A 39-year-old man has been charged with a burglary in Lloyds Road, Corby, which happened on Friday, September 28. Ross Laird, 39, of no fixed abode, was charged with burglary and for possession of Class A drugs after being arrested yesterday (Monday). A team of detectives still continue to work on a series of burglaries that have taken place in Corby in recent weeks and are pursuing a number of lines of enquiry. Detective Inspector Wayne Preece said: “There have been a number of commercial burglaries over the past month in Corby and this has caused a lot of anger, rightly so, among the community here. “I am currently overseeing an operation which is utilising resources from across the force including colleagues from intelligence, crime and crime prevention in order to tackle these burglaries and bring the offenders to justice. 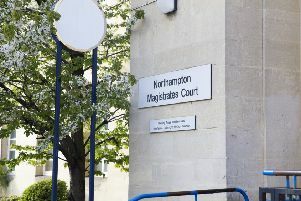 “One man has been arrested and charged with an offence relating to this series and we are determined to catch others who may have also been involved. “I would be very interested to hear from anyone who may have information about this series of burglaries or anyone who may have witnessed any suspicious behaviour in the area.